I LOVE Japanese cuisine. I really do. But apart from snacking on steamed Edamame and the occasional Teriyaki sauce that I make from scratch, I usually don't do much of Japanese food at home. I usually let my favorite restaurant satisfy my soul, when I crave for Japanese food. I am a part of this wonderful group called a Shared Meal. Its a unique group where we have members from all around the globe discussing not only food, but also our varied homes, regions, nationalities, cultures, traditions and practices. Being a part of the group was an eyeopener and an enriching learning experience. It was here that I first learnt about Tofu Steak, posted by a Japanese member. She also introduced us to simple Japanese home cooking. Her Tofu Steak looked absolutely delicious. She said she just drained the tofu for few hrs and dredged them in flour and just grilled or baked it in the pan. For the mushroom sauce she stir fried the mushroom with soy sauce or seasoning soy sauce. Since tweaking is my middle name, I just had to fidget with the recipe. So instead of of just seasoning the tofu with salt and pepper, I dunked them in an aromatic marinade made out of grated ginger and garlic, soy sauce, sesame seed oil, mirin, sake and fish oil. I also skipped the step of dredging the tofu slices in flour. I simply pan seared it with a tiny amount of oil till they were golden on both sides. They were crispy on the outside and melting soft on the inside. And for the mushroom sauce, I used a combination of Shiitake musheooms and the regular white button mushroom, but Enoki, Chantelle, Oyster and even cremini or portobello mushrooms are excellent options too. I simply stir fried my mushrooms with garlic, onion and red bell pepper and poured my reserved marinade to make the gravy. I was plain delicious. We finished off our dinner with a delicious side of soba noodles. Soba noodles (made from Buckwheat flour) are now extensively available in normal grocery stores. I however got it from Jungle Jim's. All I did was stir fry some frozen Veggies (stir fry mix veggies) with grated ginger and garlic, soy sauce and rice vinegar. Added the cooked noodles and tossed it around and its done. 1. Cut the tofu packet very carefully and gently invert the slab of tofu onto a mesh strainer and let it drain all the water for at least 30 minutes. I usually do it for around 45 minutes to an hour. 2. Meanwhile, combine all the ingredients under marinade/sauce in a shallow bowl. Mirin is sweet and the fish sauce is salty and they both complement each other beautifully. If using only Mirin, add some extra salt and a tiny spec (just a hint...) of tamarind extract. If using only fish sauce and no mirin, add a half a teaspoon of brown sugar. Mix everything and taste it, it should be sweet and salty with just a little sour undertone. 3. Pat dry the tofu with a paper towel. Cut it into big chunks. I usually get eight pieces from my tofu. For better marination and cooking my slices are on the thinner side. You can do just four thick sliced too. 4. Marinate the tofu pieces into the prepared marinate for just half an hour. 5. Heat a non stick pan over medium high heat. Spray a little cooking spray. Take the tofu pieces from the marinade, shaking off the excess and place it the pan in a single layer. 6. Bring down the heat to medium and pan sear the tofu for two to three minutes a side, till the sides are golden brown in color. Keep aside. 7. In a separate pan, heat up a tablespoon on any flavorless oil and temper it with sliced garlic. 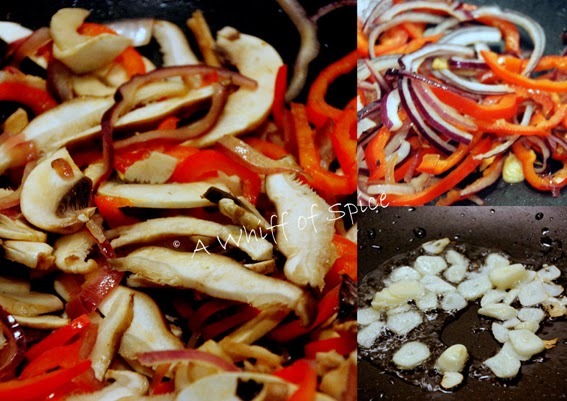 When the garlic is golden, add the sliced onion and julienne of red bell pepper. Once they turn slightly soft, add the sliced mushrooms (both variety) and saute for a minute. 8. Add the reserved marinade to the pan and toss everything well. Cook for just a minute. Take it off the flame. 9. To plate; put a mushroom sauce on a shallow plate and top it with the pan seared tofu slices. Server hot. Notes/Tip: Traditionally for Tofu Steak, the tofu is just seasoned with salt and pepper and dredged in flour and shallow fried. 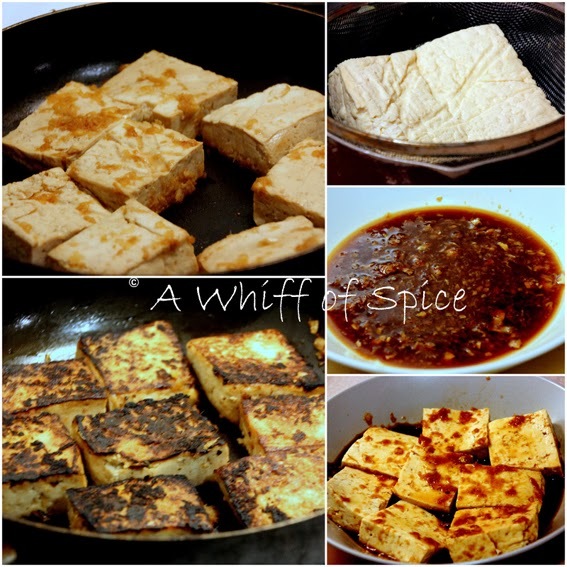 I feel marinating the tofu maximizes the flavor and its the way my family enjoys. In the mushroom sauce, I had used Shiitake and button mushroom, but Enoki, Chantelle , Oyster and even cremini or portobello mushrooms can be used. Usually no other veggies are added in the mushroom sauce, but I added some red bell pepper for color and crunch. Mushrooms are low in calories, fat-free, cholesterol-free, gluten-free, and very low in sodium, yet they provide important nutrients, including selenium, potassium, riboflavin, niacin, vitamin D and more. Though its grouped with vegetables, mushrooms provide many of the nutritional attributes of produce, as well as attributes more commonly found in meat, beans or grains, thus making it a great choice for vegetarian. Tofu is very low in Cholesterol and Sodium. It is also a good source of Protein, Iron, Magnesium, Phosphorus, Copper and Selenium, and a very good source of Calcium and Manganese. This sounds absolutely delightful! Love the marinade! Thanks so much Nupur. I hope You'll enjoy it. Thank you Elise.... So glad that you liked it. After three years of testing and 115 hours of research, we've found that Royal OakRidge Briquets are the best charcoal for your grill Does charcoal burn longer than wood?